If your boyfriend (bf) bought you a telescope like Mike suggested, kick that bf real hard and then use the telescope to see how he landed. Hopefully face on a pile of dog’s poo or better chances, cow’s dung if you kick him far enough right to the kampung. And if you are married or in serious relationship, read mumsgather’s “girls guide to Valentine” so that you know what to expect. I am not sure what I am going to advocate in this blog. But since I have been labelled something like ‘submissive to men’ somewhere in my comments board, then, let me try to live up to the image. I found this Garfield in my old house. 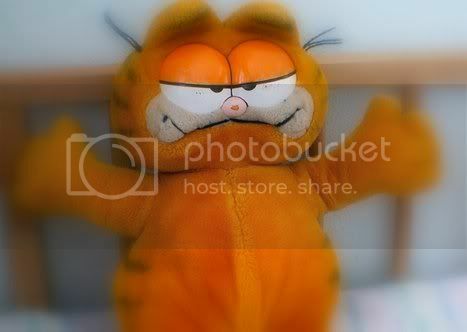 Garfield is 19 years old and cost about RM40 back then. Garfield was my idol when I was 21 yrs old because we are born in September, we love to sleep and we live with the motto ‘My diet starts tomorrow’ (which never come). My rented room in Tanjung Bungah – rented room in Kampar Road – lived with bf in flat in Prai – another flat in Prai – rented flat in Sg. Nibong – own apartment in Bukit Jambul – house in Sungai Ara – my current apartment. That makes 8 different places. Garfield was given by bf just after 6 days of knowing me. No big deal, you say? BIG deal because bf then was jobless as he was taking his accountancy exam, studying on his own (‘cos he was too broke to attend college/U). He survived only on RM2 chap fun and Chinese tea. So, forking out RM40 to buy a gift for a girl is a HUGE sacrifice. He also bought an American Greetings (or is it Hallmark) card that cost RM6 along with the gift. It was my 22 yrs old birthday gift. Moral of the story? It is not how expensive the gift is. It is how meaningful the gift is. It is how observant the guy is towards what you fancy. So, girls, does the guy know what you like and dislike? Quick, you still have 14 days to work on it! And on Valentine’s Day (i.e. after 5 mths relationship), of course, I got a bouquet of roses from bf. But *ahem* it was one amongst 3 bouquets. One from my ex-bf, one from a competitor and one from bf. But bf gave the most expensive roses, i.e. velvety red roses. The other two? Kiam siap/kedekut/koo hon/stingy guys gave pink and a mixture of colours. Because bf knows I only fancy red roses or nothing. Like my story? I got plenty to tell. See if I got the (romance) mood, I will write somemore. ‘Cos I know a lot of young ladies read my blogs. So, I am trying to brainwash them to be submissive, money-eyed and think like Barbara Cartland (is she dead yet?) heroines. *muahahahaha* Go start a spinsters’ club, all ye women who want to be equal to men. 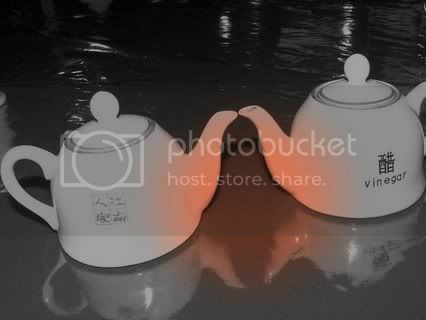 Oooh…I couldn’t resist snapping these two cute little teapot at a restaurant today. I had touched up the photo with Picasa2 (google and instal it, it is fun) software. *shriek!!! * How? Postman!!! 1 minute. How to put on a bra within 1 minute? I don’t want the Pak Pos to batal puasa, kan? MCA leaders, look at the big picture. Are your youths creating a huge undercurrent that will one day swallow us up? This is the fasting month, emotions run high, don’t let our Malay brothers and sisters feel like we Chinese are throwing money to get their heads. Please. Screw you, Youth and Sports Ministry! All of us, i.e. the rakyat and the taxpayers can say is : SCREW YOU, YOUTH & SPORTS MINISTRY AND ALL THOSE RESPONSIBLE. INCLUDING THE GOVERNMENT. Budget 2008 – It is an election budget. Period.